Sometimes, just a touch of embellishment can make an ordinary pattern special and dramatic. When Molly Hollibaugh blithely drew a slightly embellished Printemps tangle during a CZT27 Seminar session about drawing on an Aprentice tile, a soft chorus of Oooo’s and Aah’s filled the room. Printemps is a simple coil pattern, and one of the first taught during beginner workshops. By itself, it is elegant. When Molly added her simple embellishment, it became exquisite. Here is the progression from Nice! to Spectacular! 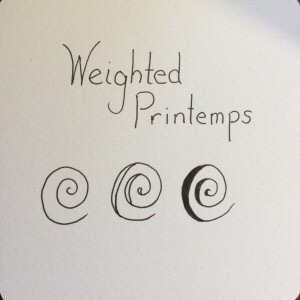 A simple Printemps element, an added crescent aura along one side on each loop of the coil, a simple ink fill–an elegant result! When I posted my “hotel tile” in the Zentangle Mosaic® app, drawn from a string I created during the CZT seminar, I received several questions about how to draw it. As you can see, it is an easy embellishment. Below is the tile that brought on queries. This tile would have little impact as a monotangle of original Printemps, but adding several weighted ones added drama and depth. Since Printemps is my “go-to” tangle when inspiration fails, I am delighted to have another option for drawing it. Just goes to show that it can take so little to add a lot! I am a CZT! 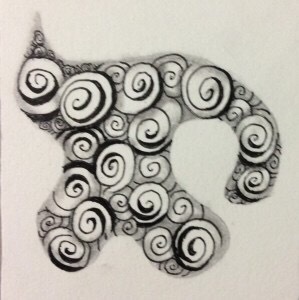 That’s a Certified Zentangle Teacher. This post is way overdue. 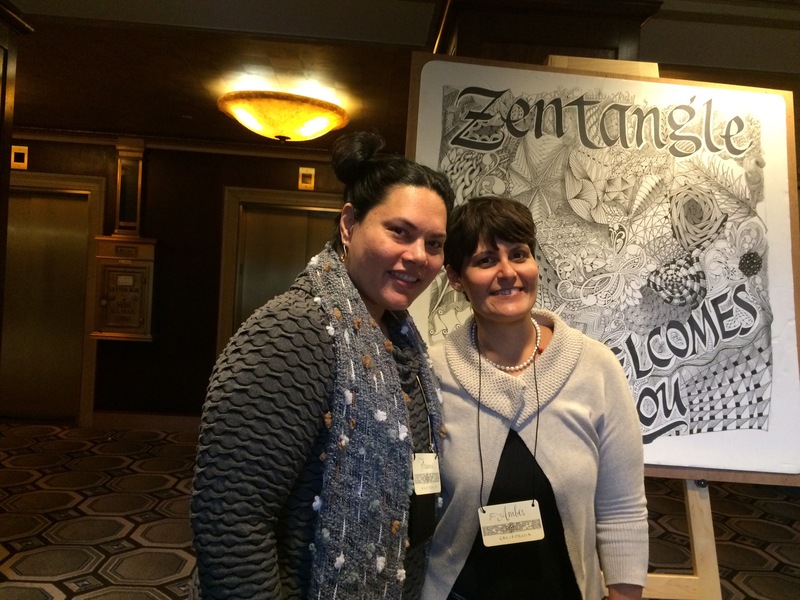 It has been a week since Seminar ended, and I am still walking on clouds from the positive energy generated by the 93 attendees, the presentations by Zentangle founders and family (relatives and adoptees! ), and the hushed intensive participation in activities and practice. Above are Frannie (my roommate and fantastic artist) and Amber (one of my favorite Mosaic app tanglers). In the second photo, I am the short old person on the right, with Frannie on the left. 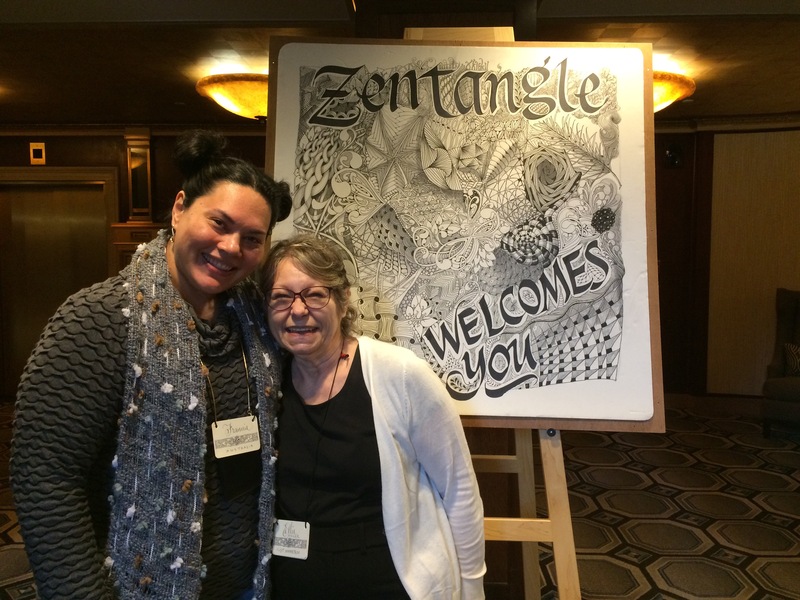 One of the best parts about Seminar was meeting tanglers whose work I got to know and respect on the Zentangle Mosaic® app. There were more Mosaic friends than I expected, as I assumed most were already CZTs–their work is that good! What a surprise to discover that so many were trainees like me! So much to discuss and learn from each other, and now a shared experience to bring us closer! CZT27 Seminar was held April 23 through April 26, 2017, in the historic and fabulous Providence Biltmore Hotel, an architectural masterpiece of Arte Neuvou and Art Deco! Every part of the building that we explored had beautiful grillwork, inlays, sculpture… a treat for the eyes and inspiration for new patterns! The staff was wonderful, polite, and friendly; accommodations were luxurious; and the ambiance was conducive to relaxation and creation. Meals were incredible master works that challenged Cordon Blu restaurants, despite our numbers. Break “snacks” could challenge formal British teas. We were so pampered! But despite the luxury, we worked. We worked hard. So much was introduced at each session! The Tuesday sessions left many of our heads spinning from the skills and information presented and acquired in that single day. I saw no one leaving the class room whose eyes were not glazed over. As always, the best part was meeting such talented artists from all over the globe–34 countries were represented (I think that’s the right number!) and more than two-thirds of the States. What a diverse and glorious group! Frannie, my roommate, is from Brisbane, Australia–an incredibly long trip crossing timelines and losing and gaining days. Others came from France, Germany, Switzerland, the United Kingdom, Taiwan, China, India, and many many more places. Our session brought the number of CZTs to over 2700 internationally. And the next two Providence-based certification sessions in June will bring that number close to 3000. With a few sessions scheduled to be given in China later this year, the number of CZTs available to teach this meditative art method will skyrocket! 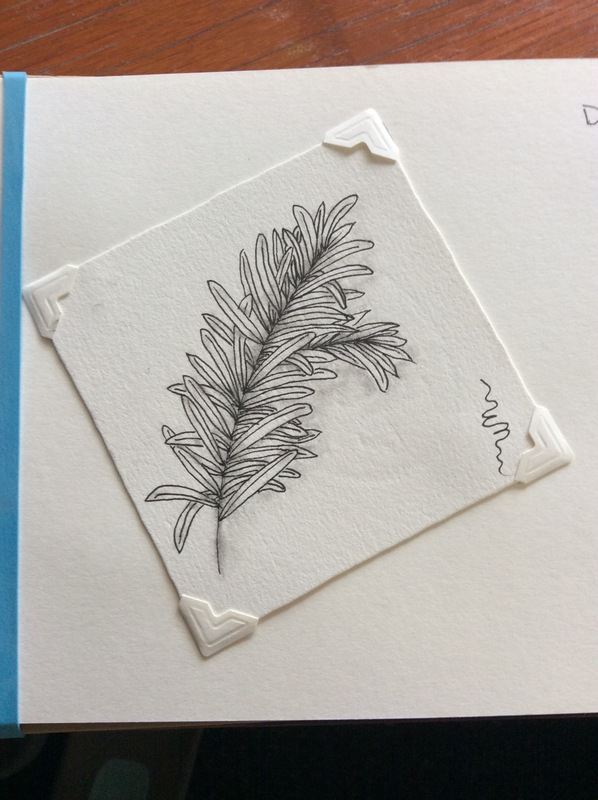 The Zentangle Method just keeps growing! We learned how to conduct the introductory workshops, mostly through modeling. Rarely were we told “Do this first, then that,” except for which tangles to teach first–and that is because these patterns set the stage for vocabulary and concepts for all the other tangle patterns created by the founders and by tanglers from all over the Internet and the world. At each new session, we started the day or session with new tools that would be used for that lesson’s techniques. I came home with almost as many gifted tools as purchased ones. Pencils and pens, samples of different types of tiles, an official Zentangle® journal, a CZT carry bag, “CZT Only” booklet of official tangles and their step-outs, and so much more. We learned new tangles and old, and string creation techniques. We learned what we can and cannot do as official representatives of Zentangle and the Zentangle Method. We learned some official vocabulary and some not so official terms. We shared our work in class mosaics that took up half a large rectangular banquet table. We got ideas for journaling and initiated them with the tiles we produced, organized under the session names. Here are a few pages from my Zentangle journal. 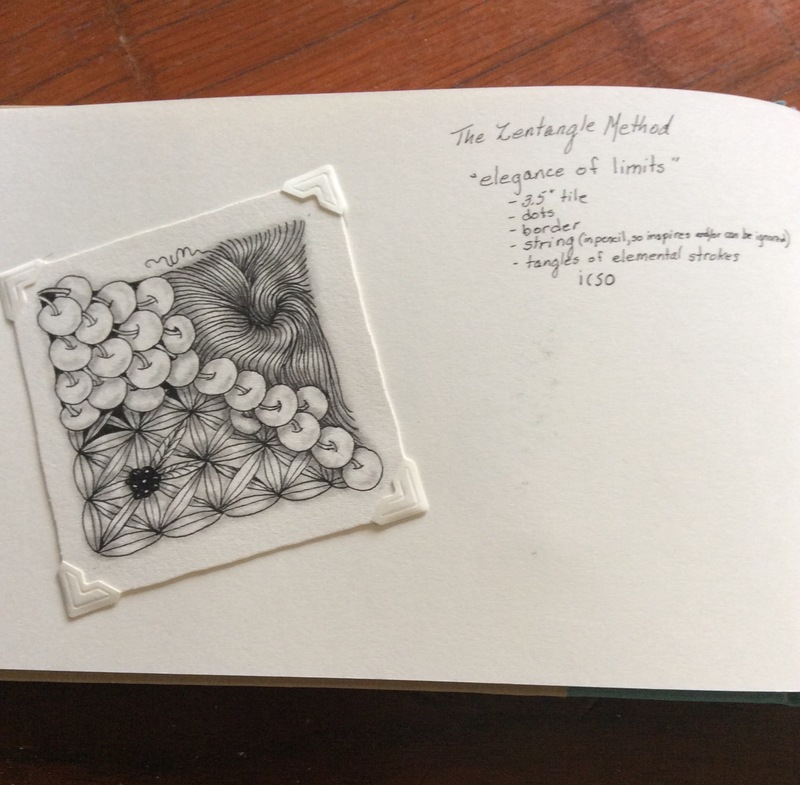 The first photo depicts the how and why of the Zentangle Method, accompanied by a powerful discussion of the elegance of limits. 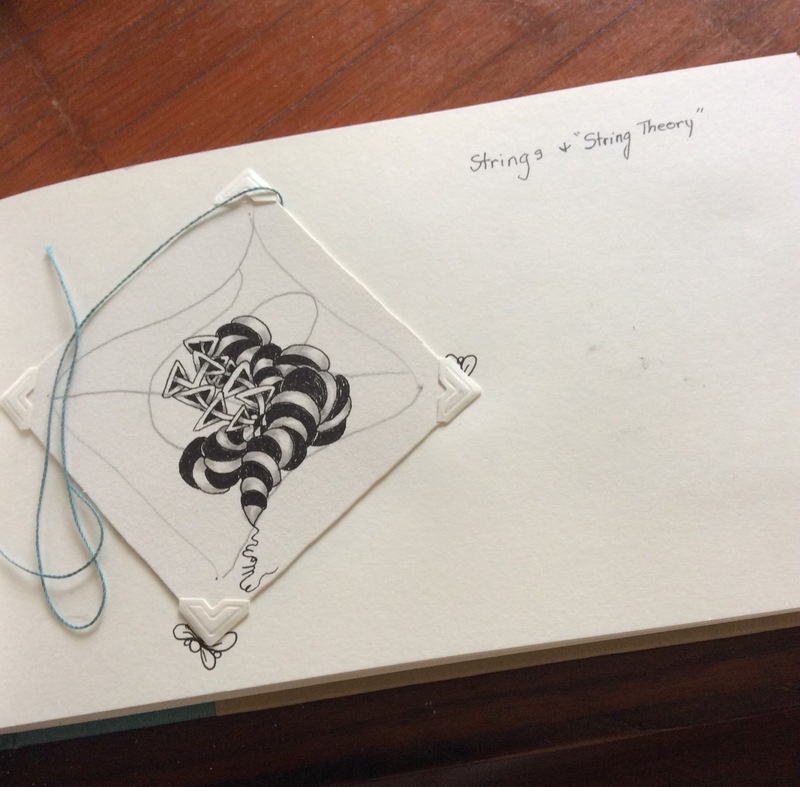 The next photo is of an unfinished tile with a string I drew for the String Theory session. After it spent some time in the class mosaic, I decided that I really like it just the way it is, with the unfilled string as part of the completed whole. The final tile is special to me. The pattern is called Verdigogh, and was one of the first patterns I tried to learn on my own a year ago. Drawn during the Deconstruction session, it represents the best Verdigogh I have ever drawn. Despite following step-outs and studying various videos on YouTube, it took watching it drawn in person for me to draw it to my personal satisfaction. How much of this was due to the presenter (Martha,I think), personal experience, ambiance, group energy, or a combination of these, I don’t know. But I am incredibly proud of the complex yet simple-to-draw achievement. There are many other tangled tiles in my journal. Over the next several posts, I will share several more. For now, I want to tell you just a bit more about #CZT27 Seminar. We tangled classic tiles, 3Z tiles, black tiles, bijou tiles, renaissance tiles, and Zendala tiles–even Apprentice tiles! We tangled in black and in brown. We learned ways to use graphite to best advantage and charcoal white pencils on tiles of any color. We each tangled a section of a seminar mosaic that was framed and given by lottery to a very lucky participant. During breaks, we marveled at the artistic creations by attendees–tangled origami sculptures, tangled plates and boxes and carvings. Tangle-decorated album and journal covers, frames, orbs, jewelry… so much to see that my mind could not absorb it all. Seeing supplies and tools in the Zentangle Store was like entering an exquisite toy shop full of potential purchases. I wanted one of everything! Unfortunately, funds and luggage space were limited. The group energy, the exhuberance of founders Maria Thomas and Rick Roberts, and the teaching techniques of Molly Hollibaugh, Martha Huggins, and Julie (whose last name escapes me) sustained our interest and activities during sessions and in between. There was humor, compassion, serious periods, and flow–lots of flow. Words cannot express the whole experience. I am so grateful to have been gifted with the CZT training experience. I was in a Wonderland where only good things and better things happen. Next time, I will share some personal challenges that could have prevented me from experiencing the full effect of the Seminar, but that quickly made me appreciate the experience even more.